Xcode has a neat built in feature that let’s you simulate a (GPS) location in the iOS Simulator. To switch it on you just need to run your app in the Simulator and then click on the location arrow on top of the debug area. 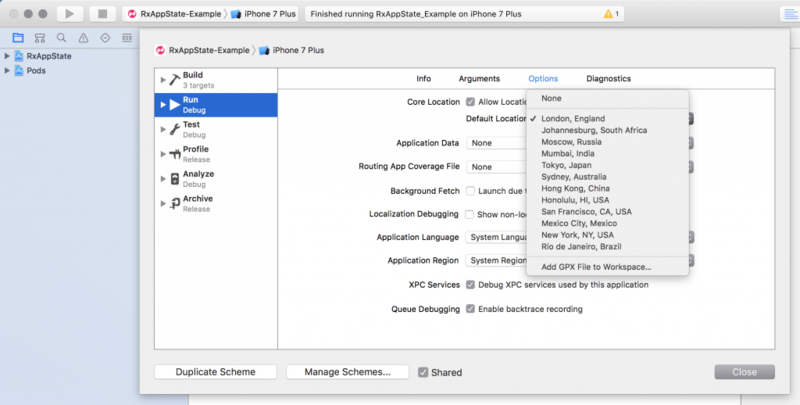 Xcode offers a handful of default locations from Moscow to Honolulu that you can use if you just need any location. But sometimes you need to simulate a certain location that is not part of that default set. For example, let’s say you are developing an app that shows all the cool bars in your hometown. Then being able to simulate the location “Honolulu” won’t be of much use to you (unless your hometown in Honolulu). To add your custom location to the Simulator you have to add a GPX file to your project. Xcode offers this file type in its New File dialog (File -> New -> File… -> Resources -> GPX File) but it is just a plain XML file so you can create it somewhere else and just add it to your project (just make sure it has a “.gpx” file ending). Now if you run your app in the Simulator and click on the location arrow on top of the debug area, you will find your custom location on top of the default locations (Xcode displays the file name of your GPX file as the name of your custom location). Select it and the Simulator pretends to be at that location. But it gets better! What if a static location is still not enough for you? Say, you want to add a feature to your “Best Bars in my Hometown”-App that allows the user to track his way home after his visit to the bar (So he can see the next day how he got home in case he can’t remember…). To test that feature you would have to make the Simulator pretend to be moving from one location to another. When you select this GPX file from the list of locations Xcode starts to simulate a movement from the first waypoint to the second waypoint and then to the third. The speed of this movement is determined by the value of the time elements. The absolute time does not matter. Xcode only uses the time difference between the waypoints to calculate a speed. So in my example it takes the Simulator 1 minute to “move” from the first waypoint to the second waypoint and then another minute before it reaches the third waypoint.